I may not have much of it at my home, but I love vintage. 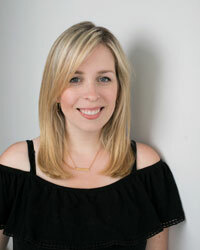 I grew up going for rides in my Dad’s vintage cars, playing with my mother’s handed-down costume jewelry and searching for captivating frocks in my Great Aunt’s closets. So this year I decided to use some of that vintagey love to make something fun for the ladies in my life who love to bake – Christmas Aprons! Not so long ago aprons were the norm, and I wish that they still were, because they are not only extremely practical, but cute too! 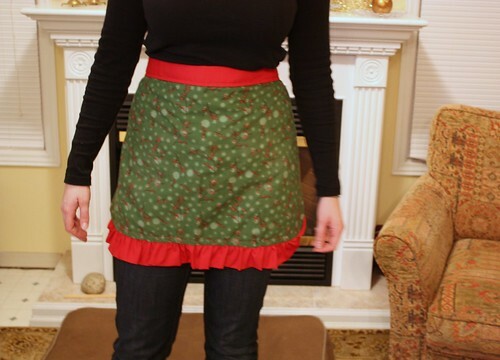 Especially a sassy little half apron like this. This weekend I was baking with my little five-year-old cousin, and my favorite jeans were spared many a sticky icing handprint. I used this basic tutorial from The Longest Year, but altered it a little bit. 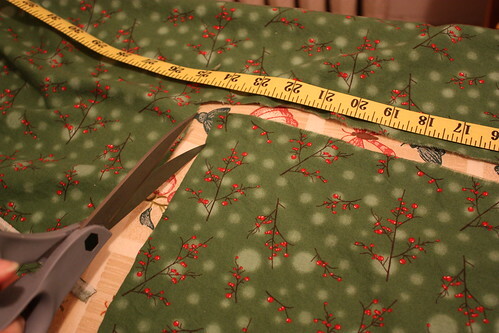 I wanted a thicker binding at the top, that was longer for tying into a nice big bow at the back, so I made my apron strings 6″ x 72″ (I had to sew two lengths together). 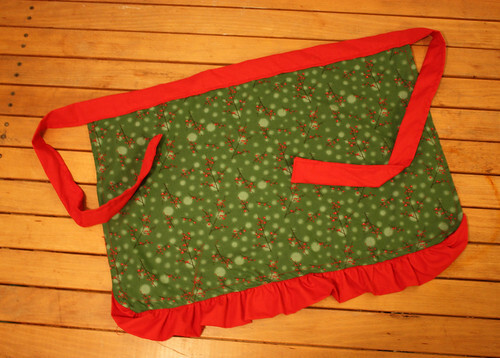 For this apron, I chose a green pattern fabric with candy red as the complimentary colour. 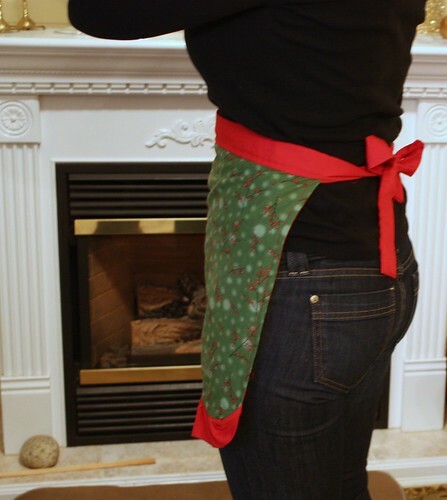 You can make this a reversible apron, so that both sides are the same pattern, or different patterns – whatever floats your boat. Some of the aprons I added the ruffle to at the bottom, and I wanted it to go well with the altered size of the binding, so I cut the fabric to 5″ x 40″. 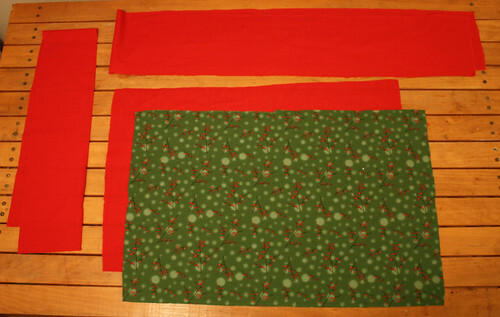 As for the apron fabric size, I kept it mostly the same, but a few of the aprons were for younger girls, so I made them somewhat smaller so that they weren’t swimming in fabric. Ironing is not my forte. I love the clean crisp look and the feeling of the warm fabric, but I just can’t be bothered to take the time to iron my clothes. 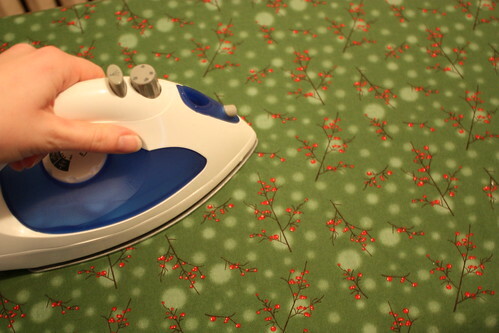 This may very well have been the only time that I actually loved ironing, and maybe that’s because it was dead easy. No need to worry about pant pleats or shirt cuffs here! And a couple reruns of Friends later, and I had an apron done. Easy, fun and super cute. These are a great, inexpensive present to make and would be a really special gift paired with a new spatula or wooden spoon, or a new cookbook. Over the weekend I gave my mother her cardinal patterned apron and she loved it. 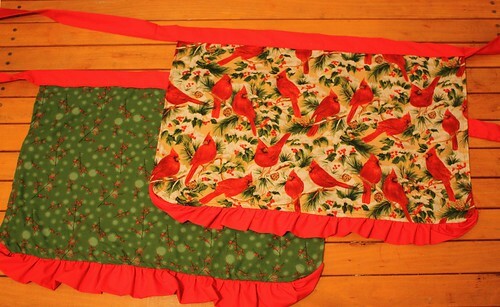 Once all the girls are home for the holidays and baking I’ll post a couple more pictures of the finished aprons. Head on over to Tater Tots and Jello for their Homemade Gift Party to see some more unique and special gift ideas!